Life-Saving Information for Pet Owners and Pet Sitters Alike! Did you know that leaving these tug toys out for your dog to play with unsupervised could be deadly? 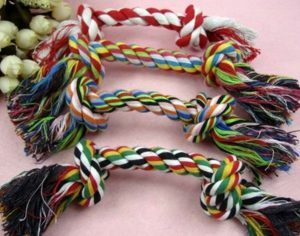 The tiny little strings these toys break up into can wrap around your dog’s intestines causing an emergency vet trip or worse. Moreover, tug is supposed to be an exciting and elusive game for your puppy. Leaving toys out like this takes the excitement out of the toy, increasing the chance they won’t want to play tug / with that toy in the future. Clean up tug toys (like stuffed squirrels, etc) as soon as you’re done playing with them and get super excited when you actually DO bring it out to play, to make the play/exercise session effective. DO keep out rubber toys, safe bones (see the link at the end of this post. It’s a youtube video from a well-known veterinarian describing the type of bones that are healthy for different types of dogs), and KONGS stuffed with treats, frozen peanut butter, melted cheese, frozen beef broth, etc. Teach them what toys ARE acceptable to chew on (don’t let a puppy generalize a torn sock-toy to your brand new couch!). In sum, it’s important to be the one who controls when your dogs will play with the just-for-playing-toys due to the effects it has on safety and excitement. When you do this, your dogs will LOVE those toys way more than they do now. Interesting post. But it’s a bit hard to read without any formatting. We so appreciate your comments. So much so that after we received your comments we touched it up so it’s formatted and more easily readable. Also thanks for the positive reinforcement. We like getting positive rewards just like our doggies do! Haha. Safety is first for our pet which must undergo with proper observation. Excellent stuff! Love the way you write and express everything. Keep it up!